My granddaughter loves this rug in her room. Exactly as described. Needed to buy non slip backing. Perfect for children's rooms, this playful shag rug offers a dash of color and an intriguing texture for any space. 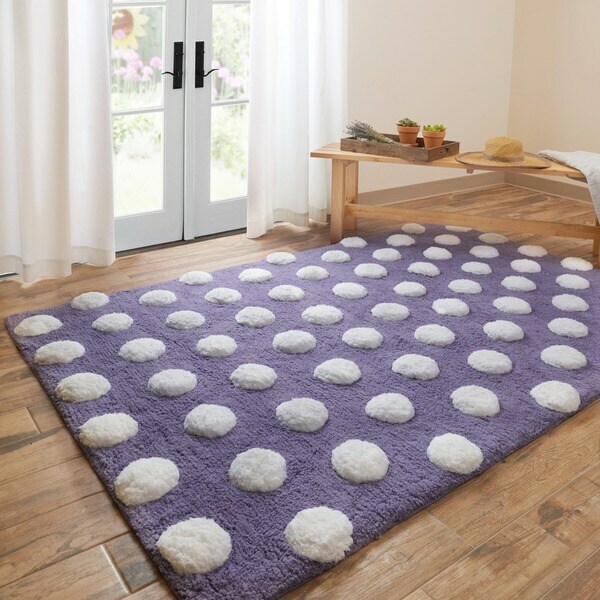 With a polka dot pattern in purple and white, the rug adds a chic touch to any color palette, while the high, hand-tufted pile and white polka dots are soft and plush underfoot. This rug is so cute and looked GREAT when it first arrived. However, while I could see that the dots were a little raised in the photo, I didn't realize *how* raised. It's reeeeally hard to vacuum...basically you have to use the hand attachment over the whole rug. Also I sprayed it with several thick coats of Scotchguard when I first got it, but that didn't prevent the snow white dots from getting really dingy *really* fast - and my daughter really only uses her room to sleep (plays in living room), so it was very low traffic. I tried several brands of stain remover and couldn't get it completely clean so it looked pretty gross within 6 months. Plus the fabric in the dots was coming out and getting all stringy and nasty looking. I decided to get rid of it at that point. So not a great buy for 6 months of use. This rug is thick and the color is brilliant! This rug is so cute! It is plush and soft. Adorable in my daughter's polka dot themed room. This rug is absolutely adorable and goes perfectly in my little girl’s bedroom with purple and white polka dot bed set. LOVEE this rug- so cozy. Do not walk on it with shoes as the white part gets dirty easily. This rug is adorable in my daughters room. It's so cute and very soft. My kids love to play on it. My daughter is still learning to walk and this provides some extra cushion for her. Looks good initially. Impossible to vacuum. Love the color. It will look great in my granddaughter’s room. I recommend spot cleaning using no harsh chemicals.